A language without metaphors creates a society without imagination; Marketing is the creative pursuit of metaphors and must transcend abundant adjectives; Great Marketing Endeavors allow for the story of your brand or business to be told creatively. 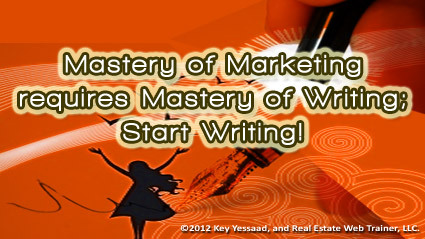 The only way to master such an endeavor is to commit yourself to writing stories; stories about your Real Estate Listings; stories about your vision; stories about how you help your local Sellers; stories about you attending community events; stories about your business colleagues; Stories; Stories; Stories… You cannot escape writing if you wish for the mastery of Marketing; and this is why I find blogging the most organic medium for sharing said stories – when you force yourself to write once a week you discipline your mind to start working with you to nurture creativity; and yes your mind needs to be whipped into shape from time to time. Embrace writing and the sunshine of creativity will brighten your business.